Dielle offers a variety of workshops throughout the year on yoga/movement, meditation, somatic voicework and other mind/body/spirit topics. 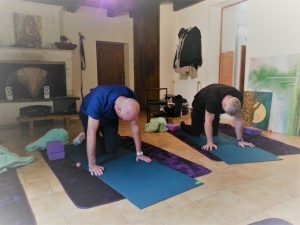 This will be a six week course starting March 27th in Brossac (16480). We’ll cover all the basics slowly, talk about modifications, and focus on body awareness. It’ll be the perfect entry into movement for yoga resisters/procrastinators, those who have been curious but tentative, and those who prefer to start from scratch in a safe, nonjudgmental environment. Class will have a maximum of 5 participants and everything you need will be provided. To receive updates, please contact me. You might find this post about 3 things beginners should know helpful. The 6 – week series is 89 € payable in advance in order to reserve your spot. 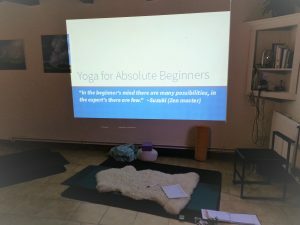 Yoga Hot Topics are one-time workshops to address through movement and other tools an assortment of issues from anger, nervous tension, anxiety, detox, shoulder pain, back pain, etc. You’ll learn specific practices that when done on a regular basis at home will help you manage and/or improve such conditions or states. May 5th, 2018 – Did you miss this workshop? Watch the video! Yogi Bhajan says that anger is having no relationship with yourself. Learn a very powerful kundalini kriya (or sequence) to help you safely express and expel deeply held anger to transform it and come back into relationship with yourself. July 7th, 2018 – Did you miss this workshop? Watch the video! Class will consist of a short informational talk about this important muscle complex, followed by a 75 minute gentle, slow and deep lengthening and releasing of the psoas. Be ready to relax deeply. 2 – 5PM 30€ This will be an interactive, creative exploration of our narrative vs. our direct experiencing neural circuitry. 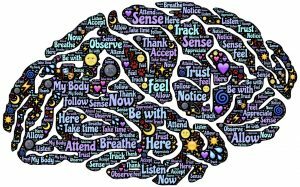 In other words, we’ll exercise the parts of our brain that we don’t use as regularly in day to day living and instead, zero in on our real-time sensory experiencing…mindfulness. This exploration will be body-focused through somatic movement and creation-focused through artistic expression. This is a three hour workshop.